Whenever someone finds out my latest book, the thriller THE FINAL MAYAN PROPHECY, is about December 21, 2012 and the end of the Mayan calendar on that date, they ask if it really means the end of the world. Asteroid hits earth: According to recent reports from NASA, the odds of a really big asteroid hitting the earth in the next 28 years are 1:625. That’s .0016 or .16%, or way less than a 1% chance, and that’s within 28 years. Nuclear war: The Doomsday Clock sits right now at 5 minutes to midnight. The closer the clock is to midnight, the closer the world is estimated to be to global nuclear disaster. (All of this is according to Wikipedia, not always reliable but as best as I can tell, is accurate in this case.) The latest adjustment, made on January 10, advanced the clock one minute to its present position. To me, that means nuclear war is a little more possible (1.67% more; one minute more out of 60) than it was last year, when we successfully escaped global disaster, so, rounding up, I’d go with maybe 2% as the odds for global nuclear destruction. Keep in mind, I’m no statistician. Solar flare sends us back to the Stone Age: According to a report in last month’s Christian Science Monitor, which gets this information from NASA’s Solar Dynamics Observatory, “When aimed at Earth, strong solar flares and CMEs [Coronal Mass Ejections] … can pose a danger to astronauts and satellites in space, as well as power grids, navigation and communications systems on Earth.” Reporter Amina Khan, writing in the Los Angeles Times, quoted space weather scientist Mike Hapgood at the Rutherford Appleton Observatory near Oxford, England about the odds of this happening,. “A recent paper (published in February in the journal Space Weather) tried to estimate the chance … and came up with a value of a 12 percent chance of it happening in the next 10 years.” It’s probably not technically correct for me to average this over ten years, but if I did, it’d be a 1.2% chance each year. So, after looking at these scenarios, I think the odds are small that December 21, 2012 will be the end of time. Did the Mayans think that way? My personal philosophy is always one of great hope, that even out of the worst situations, good emerges. To find out if and how I carry this through the plot of THE FINAL MAYAN PROPHECY, you’ll need to read it. I thank you if you do. **If you read this blog and would like to read one of Tony’s books, he will give you for free the e-book version of his first novel, SECOND ADVENT, which was published by Five Star in 2002. Write him through the Plainfield Public Library at communitycentral@plainfieldlibrary.net to obtain it with “Tony Perona” in the subject line or body. The Hunger Games event at Rave! 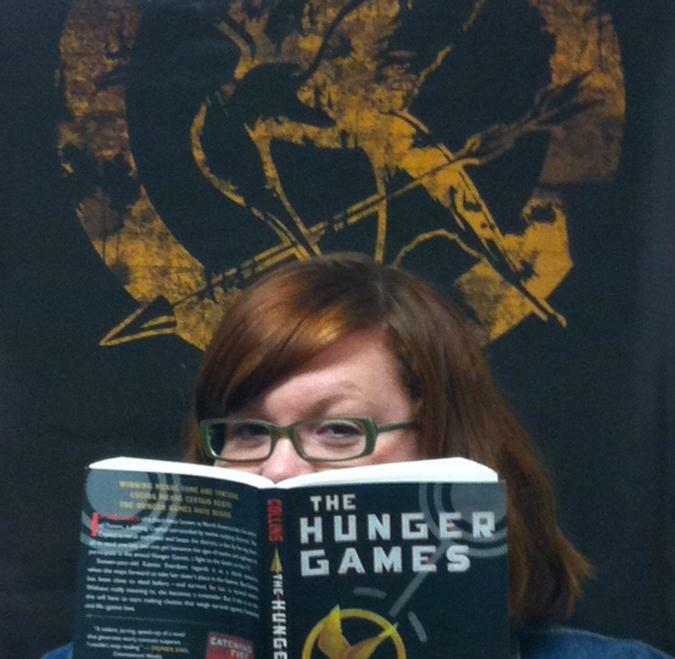 Who’s excited about the seeing The Hunger Games this week? 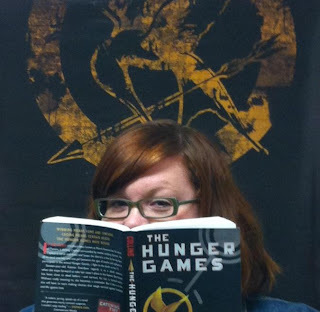 Personally, I am over the moon about watching the big screen adaptation of the book by Suzanne Collins. I was obsessed with the story when I first read the book and would discuss it at length to anyone who would listen. Would I volunteer as a tribute? My strategy if I were to participate in the Games? Peeta vs. Gale? You name it, I talked about it. Many years after reading the book, I’m still in love with the story. As we get closer to the movie release, it’s hard to find someone that hasn’t heard of the series. Are you planning to see the movie when it comes out on Friday, March, 23rd? If so, the library would like to sweeten the experience! You decided to subscribe to follow the blog to receive awesome, funny, totally informative and cool news from your favorite library’s new blog, and well… the potential to win Panera Bread for a year was a great incentive, too. So who won? Liddy is our bread-loving winner! She’s won a certificate to receive Panera Bread for an entire year. But don’t be sad if you’re not Liddy. There’ll be plenty more opportunities to win things, plus you’ll be up-to-date with what’s going on in the library, and being able to communicate with us here isn’t bad, either. In fact, head to the library lobby tomorrow at 3:00pm and say the magic words “Be a Smart Cookie: READ!” to get a tub of Papa Murphy’s chocolate chip cookie dough while supplies last. Follow the Blog & WIN! We’re live, on the air, and blogging… this is it! Introducing the Plainfield-Guilford Township Public Library Blog! Follow us here to get updates on what’s going on in the library, what we’re up to, what new services we have to offer, what books we’re reading, movies we’re watching, music we love/hate, and programs we’re hosting! See pictures here, lists of books to read, fun crafts to make with your kids, you name it! There are many reasons to keep up with this blog, and we promise it will be totally worth it! You’ll be the first to know what’s going on, plus if you follow now, you’ll be entered to win a prize! Start following this blog by email. This one’s required. To do so, just enter your email address in the “FOLLOW BY EMAIL” box in the right sidebar. Don’t forget to check your email and activate your subscription! Leave a comment below letting us know you’ve done this for your first entry. “Like” us on Facebook. Yep, we’re on Facebook, too! Go to www.facebook.com/PGTPL and like us. It’ll be worth your while; we’ve always got cool stuff to share with you on Facebook. Don’t forget to leave a comment below letting us know you “like” us to be entered. Update your Facebook status with a link to this blog. Don’t be shy: spread the love you have for your favorite library to your facebook friends! They’ll appreciate it, and so will we. Leave a comment below letting us know you’ve spread the love for another entry! Follow us on Twitter. We’re on Twitter, too! Head to www.twitter.com/PGTPLOnline and start following us. We’ll follow you back, we promise! Don’t forget to comment on this blog here and let us know you’re following us on Twitter for another entry. Tweet about the library blog. Plain and simple, just tweet about this blog, including a link. Comment below letting us know you tweeted, and we’ll give you yet another entry. The winner will be chosen randomly. Remember, you’ll be entered once for each thing we do, and that means that you can be entered up to five times! When the contest ends, we’ll throw all the entries into the proverbial hat and draw one out. It’s that simple! The winner will be announced after Friday, February 10. The winner will be contacted via the email they’ve subscribed with. After the winner has been contacted, their name will be announced on this blog. If the winner doesn’t respond within ten days of the contest’s end (February 10), a second winner will be chosen. Surely you want to know what the prize is, right?! The wonderful, phenomenal, fabulous, delicious prize is Bread for a Year from Panera Bread!! You’ll enjoy bread once a month for twelve months, and how cool is that? All for following your favorite library’s blog, which is a pretty cool thing in and off itself. Get ready, get set…. subscribe!